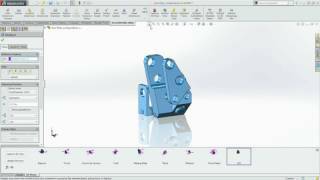 SOLIDWORKS MBD (Model Based Definition) is an integrated drawing-less manufacturing solution for SOLIDWORKS. SOLIDWORKS MBD guides the manufacturing process directly in 3D instead of using traditional 2D drawings, which helps streamline production, cut cycle time, reduce errors, and support industry standards. Beyond 3D PMI definition, SOLIDWORKS MBD helps organize the rich data into clean and structured 3D presentations with different views and display settings. It can even intelligently show and hide 3D annotations while you are rotating the model to give you extra clarity while still respecting all the critical-to-function annotations. deliverables, such as Engineering Drawings, RFQ, and Inspection Reports. gives you competitive advantages to win more contracts and deliver projects to strict requirements, on time, and on budget.